Are you a large group on holiday or holding a dinner party with friends? 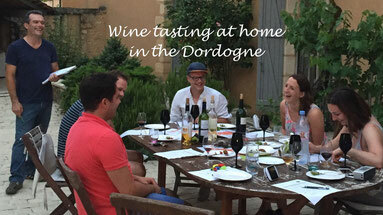 If you would like to explore the Bergerac wines but getting to the vineyards is difficult, then a home wine tasting with Max may be perfect for you. During the tasting, Max shares his local knowledge about the wines, the different terroirs and the rich history of the vines. Tastings take place from 18.00-20.00, we provide the wine glasses (so no washing up); we bring some nibbles and also tasting guide sheets. And at the end of the tasting we leave all the wines with you so you can continue to enjoy them. He has more than 25 years experience in Relais & Châteaux and Michelin-starred restaurants across Europe and the Far-East. Thanks to his travelling he is multi-lingual in 5 languages (Italian, English, French, German and Spanish - plus a little Japanese!) and has a passion for food and wine.